The nose is serious: Black Cow® candy bars dipped in caramel made from cream and black strap molasses in a huge witches’ cauldron in a misguided attempt to replicate the viral popularity of Cronuts with stunningly delicious chocolate caramel caramels–the redundancy being intentional–only to have someone later dump a cedar bucket full of mahogany sap into the same cauldron. The resinous richness induces a dream-like glow that makes one feel that he’s just walked into a Rembrandt painting. On the mouth, there is but one word: incredible. Incredible. OK, I’ll add some more if you insist: A clutch, late inning hit to put your team ahead. Hot fudge sauce on coffee ice cream. A new deck of playing cards. Effusiveness. Bacon with a mayo/mustard blend that pulls out the high, bright notes. A huge tree yanked from banks of the Amazon and placed in the middle of a fancy parlor and bedecked with enough herbs and flowers that it glitters like a Christmas tree. Am I finished yet? Nope: Butterscotch topping of such high quality it’s deemed hors catégorie. A fermented cherry in the La Brea tar pits, preserved perfectly in perpetuity as a trilobyte tried a bite of it. Fake gardenias crafted from lemon rind and white chocolate-dipped emery boards. The finish is candy orange slices molded into the shape of a cornucopia made of old sandalwood and topped with mango zest, mahogany zest and white truffle oil. But this is no horn of plenty: it’s an orchestra of plenty. A plenty of plenty. If out of control hype were to mate with a truly rare beauty, their progeny would be called Pappy Van Whistle. And around the house, they’d call him “Hog” when he was young, and “Boss” once he got a little older. In our humble, but immaculately informed opinion, this is perhaps the greatest rye of Rye Nation. We clicked a column on our Excel spreadsheet and this one came up as perhaps the greatest. Yes, we have an Excel spreadsheet for such things. And yes, it’s oddly tentative. But we’re not: give the Boss the title. 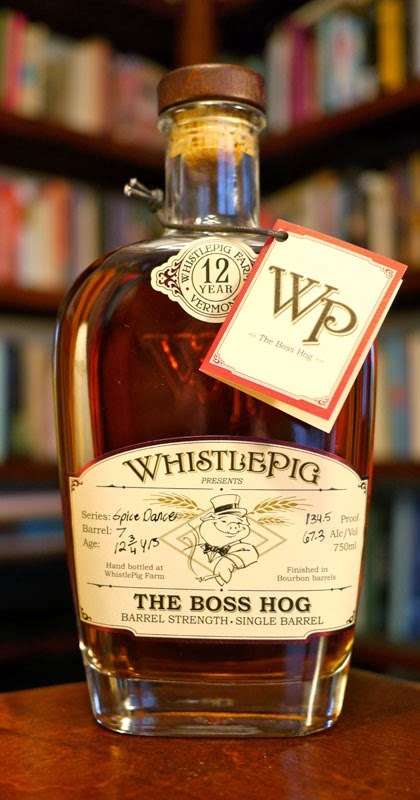 The WhistlePig Boss Hog is former Texas governor “Big Jim” Hogg–Big Jim is worlds better than the one that might first come to mind here, J.D. “Boss” Hogg from The Dukes of Hazzard. Though both spell their names with two g’s, Boss Hogg was a ridiculously lame excuse for a TV character, while Big Jim was a statesman who named his daughter…wait for it…wait for it… Ima. And there’s an urban legend he had a sister named Ura. It just doesn’t get any better than that. –Our thanks to Daniel Khan and WhistlePig for the sample!